XINING: Noted Chinese experts on Islamic studies and ancient book protection have called for immediate measures to protect the country's oldest handwritten copy of the Koran from further damage. The 30-volume, 867-page Koran with silk covers is kept in a safe box at the Jiezi Mosque in the Salar Autonomous County of Xunhua in Northwest China's Qinghai Province. A preliminary authentication suggests it was written sometime between the 8th and 13th centuries. Experts say the book is facing the threats of erosion, decay and theft, though mosque workers are doing all that they can to preserve the sacred Islamic text, which is only shown to visitors with the approval of the local religious administration, about 10 times a year. "If the Koran is not meticulously protected, it might decay in 10 years," said Ma Qing, director of the religious administration of Xunhua County. "We're in urgent need of funds to build a safer, better ventilated, air-conditioned storeroom for the document." The shabby storeroom at the mosque, according to Ma, has a pond next to its outer wall and is humid most of the time. "In fact, some of its pages have already turned yellowish and fragile, and some words are less legible," he said. 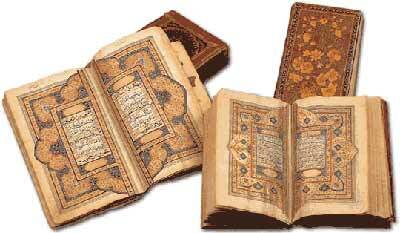 Ma said the Koran is extremely valuable because it is China's only copy written by Muslims in Arab countries. According to legend, the ancestors of the Salar group, one of the 55 minority ethnic groups in China, left their homeland in Central Asia in the 13th century with a white camel laden with a Koran to escape warring among the different clans. Upon their arrival at today's Xunhua, after a long and arduous journey, the white camel disappeared, reappearing the next day in the form of a wellspring. The Salar named the wellspring after the camel and settled in the county. "The Koran was brought to China by the ancestors of the Salar," said Ma Chengjun, a Salar scholar and director of the Qinghai provincial institute of ethnicities. "It is one of the oldest and most complete handwritten Korans in China, and the Muslims of Salar regard it as a gem." He said many scholars from the Arab world echoed the view. "When I visited Turkmenistan in the year 2000, a number of Islamic experts confirmed there are written records to prove the Salar people did take a copy of a handwritten Koran with them when they moved eastward." The handwritten scripture was sent to Syria for display at an exhibition in 1954, and was praised as a "rarity" in today's world. In 1958, the Qinghai provincial government sent the Koran to Beijing for better preservation, but brought it back in 1982 at the request of the Salar people. Some local people have suggested the provincial government build a museum housing the Koran and related religious materials. Others propose the existing Koran be copied onto compact discs for public display with the original kept in a museum. The China Islamic Association is soliciting further suggestions from the public before making the final decision, according to Yu Zhengui, vice-president of the organization. Meanwhile, further research is underway to find out when exactly the Koran was written. "We'd assume it was written around the 8th century if we can find out, with high-tech devices, if it was written on sheepskin instead of paper," said Professor Zhong Jikun with the Arabic Department of prestigious Peking University, "because papermaking technology was not introduced to the Arab world until AD 751."